Sheds. Every man dreams of his perfect shed; there’s books written about men and their sheds. There’s even lady-sheds; although they tend to be marketed as garden rooms. We all know they’re still sheds, though, and they’re every bit as great as any man-shed. There are rules to sheds. You can’t just plonk them anywhere if you want to get the best out of them. The “bottom of the garden” is just a front – there’s a lot more to the shed than that. Sheds are many things to many people – they serve as a retreat to potter with plants, or to do some sketching or painting. Many books are written in sheds, many sculptures are crafted. Being at the bottom of the garden allows people to get away from the phone, from cold-callers and from the rest of the family. It can be a home from home; a clubhouse for teenagers or, sometimes, a humble storage space so that there’s more room in the main house. It has to be done right, though. Once upon a time, the bottom of the garden was the optimum place. It’s still great, but many modern sheds, especially lady-sheds, need cabling and water running into them. This means they might need to be a bit closer to the house, or at least somewhere where there’s unobstructed access to amenities. The ground must be level, wherever the shed is to go, and you’ll need a strong membrane under itand possibly concrete slabs to support the base of the shed. The shed also needs to be somewhere where it’ll get a lot of natural light. It’s all very well having electricity in there, but sometimes you’ll want to get away from all that, and it’s nice to have sunlight streaming in, especially in winter, when it helps to warm the space. Look into big windows on one or more sides. After that, the interior is up to you. Of course, once you’re inside the shed, you go into another place, but you also need to look at the structure from the outside. 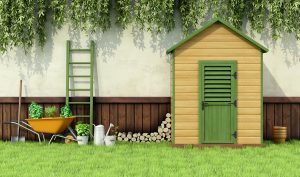 These days, many people choose natural wood finishes to maintain an organic sort of look, although some people choose brightly-coloured paints to make the shed really stand out. Whatever you choose, think of the environment and select paints or stains that are low in VOCs (volatile organic compounds) to help the environment. Who doesn’t want a shed? Copyright for the image within this blog post is owned by ‘archidea’, and has been licenced for use on this blog post through Big Stock Photo (stock photo ID: 86292263). For questions relating to this image please contact the copyright owner directly.